Love the cutesy, warm, gooey charm of a cookie but want to combine it with the mystery of a speakeasy or drug deal? Fat Cookie’s got you covered. If you’re in San Francisco, look for the building with a string and bag hanging down. 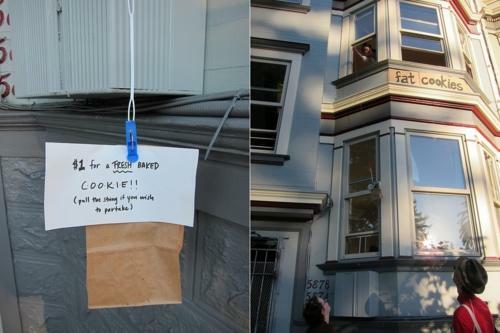 Put a dollar on the string, pull it, and they’ll send the bag down with a cookie. Genius. You can find out when they’re open by following them on Twitter or Facebook. And if any of you live in or near San Francisco, let me know how their cookies are!